South African president Jacob Zuma addressed the nation on live television to make the announcement that Mandela, or Madiba as he is known in the country, had died at the age of 95. His grandson Ndaba recently told a local broadcaster that Mandela was "not doing well at home in bed". “Even though you can see he is struggling, the fighting spirit is still there with him" Mandela's daughter Makaziwe told South African Broadcasting television news. 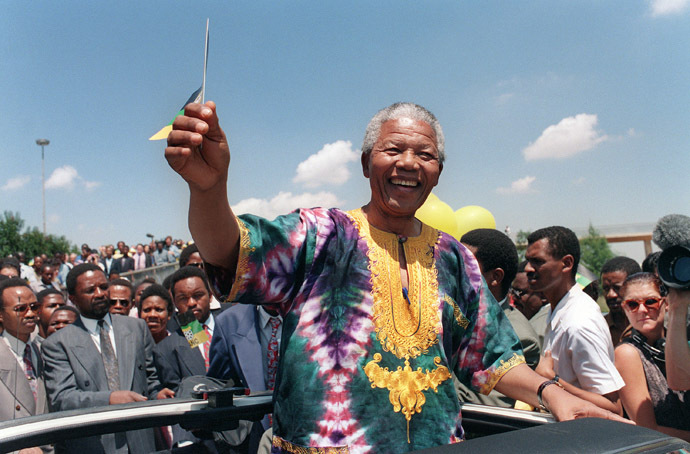 For many, the name Nelson Mandela recalls the historic moment on February 11, 1990, when Prisoner 46664 was released from a 27-year hard labor sentence. An experience that would have broken the will of the strongest individuals, Mandela emerged from his cramped cell with his infectious smile and steely determination still intact, his dream of democratic rights for all South Africans closer than ever. Securing his release from prison, however, was just one chapter of a life devoted to ending the racism that Mandela had acutely felt while growing up in the Eastern Cape of South Africa. Born on July 18, 1918, into the Thembu royal family, Mandela enjoyed rights not granted to most black Africans. He pursued a law degree at the University of Fort Hare and the University of Witwatersrand, where he was the only native African in the faculty. Eventually, Mandela grew to deplore the rampant racism of his homeland and joined the African National Congress (ANC) where he worked to end the system of apartheid, otherwise known as white-majority rule. Initially believing that government-mandated racism could be eliminated by following the teachings of Mahatma Gandhi, Mandela committed himself to the principle of peaceful non-resistance. With the anti-apartheid movement delivering no tangible results, however, he came to the conclusion that fundamental change would only come to South Africa through militant resistance. The guerrilla tactics of Cuban leader Fidel Castro and Che Guevara soon replaced the non-violent approach advocated by Gandhi. Mandela was one of the co-founders of the armed wing of the ANC, known as the Umkhonto we Sizwe (‘Spear of the Nation’), which carried out its first guerrilla attacks in December 1961 against government facilities, an act that quickly saw the group branded as a terrorist organization. In 1962, Mandela was charged with four counts of sabotage and conspiring to overthrow the government. He escaped the death sentence for treason, but was sentenced to life imprisonment. 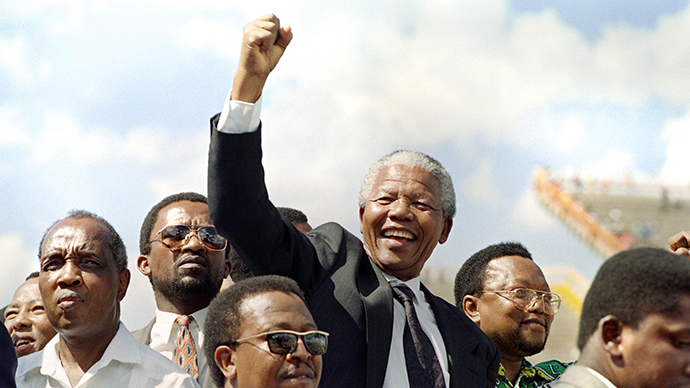 When Mandela won his release from prison in 1990 following intense international lobbying, he continued his anti-apartheid campaign without missing a beat. In April 1990, he was elected deputy president of the ANC; two years later he was elected ANC president. On April 27, 1994, South Africa held its first multiracial elections. The ANC won 62 percent of the vote, and Nelson Mandela, as party leader, was inaugurated on May 10, 1994, as the country's first black leader. During Mandela's presidency, a sweeping number of social reforms were enacted to mitigate the country’s brutal apartheid legacy. Free healthcare was introduced for all children under the age of 6, while public spending on welfare and social grants increased dramatically. Additionally, compulsory education was introduced for African children between 6 and 14 years of age, while free meals were provided for up to 5 million school children. Mandela also initiated the Truth and Reconciliation Commission to investigate past human rights abuses. In remembering the legacy of Nelson Mandela and his lifelong battle against apartheid, it would seem fitting to briefly mention Frederik Willem de Klerk, the seventh and last president of apartheid-era South Africa. De Klerk is widely recognized for his efforts to transform South Africa into a multiracial democracy, providing equal rights to all citizens regardless of color. Without de Klerk’s contributions to ending white-majority rule, Mandela's epic journey may have been marked with far greater violence. Nelson Mandela shared the Nobel Peace Prize with de Klerk in 1993 for their role in bringing an end to apartheid. 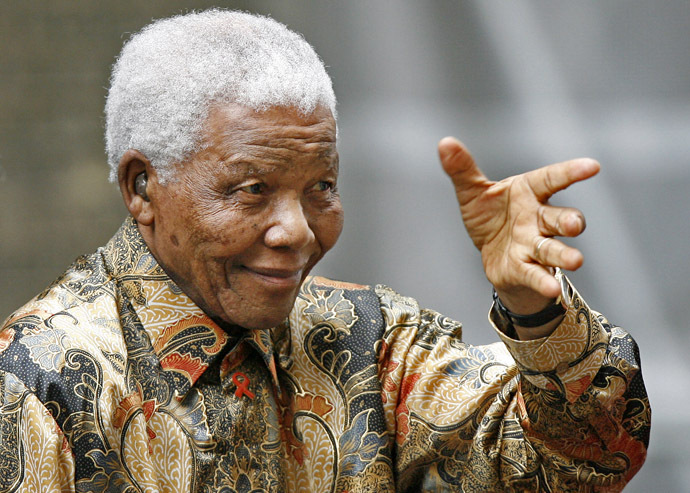 Already the oldest South African president at the age of 75 when he entered office, Mandela declined to stand for a second term, retiring in 1999. In June 2004, at age 85, Mandela, affectionately known in South Africa by his clan name, ‘Madiba,’ announced that he would be retiring from public life. Despite his retirement and advanced age, Mandela continued his humanitarian work behind the scenes. He was a strong advocate in the battle against AIDS, the disease that ravaged the population of the African continent, which Mandela personally feared he had not worked hard enough to eliminate. In July 2004, at the age of 86, Mandela flew to Bangkok to speak at the 15th International AIDS Conference. The 95 year-old had been hospitalized on June 8 for a recurring lung infection, a condition some have speculated was exacerbated by his contraction of tuberculosis in 1980 while still being held in prison. While the ailing Mandela's condition deteriorated, South Africans visited the Johannesburg home of the country's spiritual leader. Many school children left painted stones bearing prayers for his recovery outside the gates of his house.